State employment numbers came out this week. This ultimately leads to press releases and prognostications that now, things are starting to look better for job seekers. The good news: At 6.9 percent, Oregon’s unemployment rate fell its lowest rate in more than five years. The not-so-good news: Oregon’s employment growth is lagging the nation. The bad news: Oregonians are giving up on work at a more rapid pace than the rest of the US. The figure above shows that US employment is one-half of one percent lower than it was in 2007. In contrast, Oregon’s employment is 1.3 percent lower than it was in 2007. 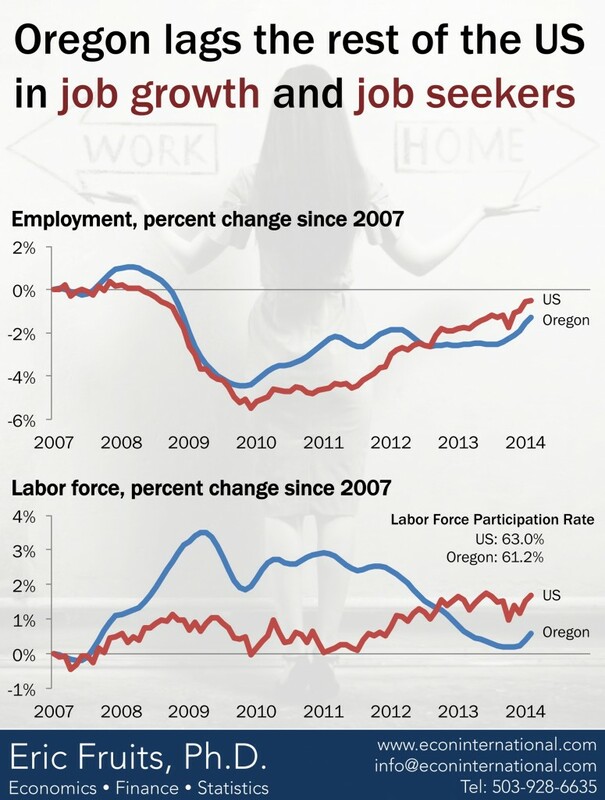 Beginning in Fall 2012—where the two employment lines cross—Oregon’s employment growth flatlined, while US employment continued slow, but steady growth. The bottom panel of the figure shows that the US labor force has increased by 1.7 percent since 2007. A the same time, Oregon’s labor force has grown by only 0.6 percent. The state’s labor force participation rate dropped off through the recession and recovery. It has leveled off and bounced around 61.2 percent for the past six months. In contrast, the US labor force participation rate is 63 percent. At first glance, the difference in the two rates seems almost insignificant. In fact, it may be a big deal. If Oregon had the same rate of labor force participation as the US as a whole, then the state would have about 57,000 more people in the labor force (that’s more than the entire population of Corvallis). If that number is added to the number who are in the labor force, but unemployed, then Oregon’s unemployment rate would be 9.5 percent. Going into the recession, Oregon’s labor force participation rate was about the same as the US rate. Through the recession and recovery, Oregonians left the labor force more than other Americans. Thus, while the unemployment rate may look OK on its own, it belies a deeper problem of people leaving the labor force.